The Strain: Mister Quinlan–Vampire Hunter #2 Review – AiPT! The issue opens with Quinlan bloody, not from drinking but from battle. He is no longer a skinny young man. He is a warrior in the arena that is starting to draw attention and a bit of fame. 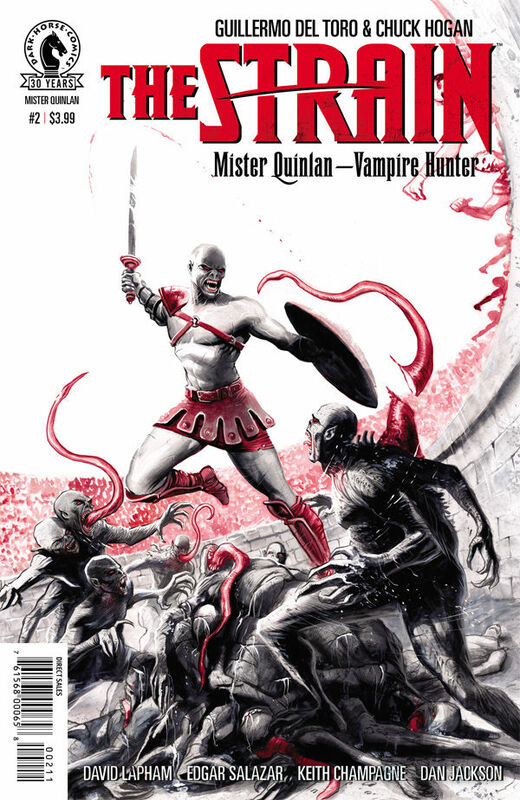 The Strain: Mister Quinlan – Vampire Hunter #2 is a battle heavy issue. Gore lovers will not be disappointed as red and white blood is spilled in and under the arena. Quinlan is still trying to come to terms with who or what he is. If you know of Quinlan from the books or television series then you know he is dignified and regimented. He respects order and has a sense of honor. This issue explores the origin of his internal code. Quinlan is fascinated by the honor of men, especially one Gladiator in particular. He actually aspires to be like this one champion but while he emulates the ways of man he cannot deny that his other half is far from human. So let’s talk about the Strigoi for a moment because stingers are flying people! We have a brief encounter with the Master. He is still on his mission to destroy Quinlan, no surprise there. The intriguing part of this issue is that we are also introduced to new Strigoi. This group is going to be a game changer for Quinlan and readers. The art is well done, capturing every detail of muscle, armor and weaponry. The expressions on the character’s faces are excellent. Anguish, determination and horror emote through pen and ink. A standout for me is the panel where the recently turned, disfigured fighter attacks through the cell door. It is brilliantly disturbing. You aren’t quite sure where a stinger will protrude from next. Another standout is the shot of a worm burrowing into one fighter’s eye. You see the terror in the character’s eyes and know there is no way to save them. One downer for me was the drawings of the emperor. I felt they lacked consistency. His features seemed to change from page to page. At one point he seemed to be depicted as many years younger than in earlier frames. Did I like It? Yes. I want to learn more about the Strigoi half of Quinlan. Fans of The Strain need to check out Mister Quinlan – Vampire Hunter. My Fears? The story is moving a bit slow. Understanding Quinlan’s value base is important but I am not sure you needed an entire issue. I hope this speeds up a bit and gives us more meat in upcoming issues.